The last album of Disgorge’s original run “Parallels Of Infinite Torture” heralded the end of an era. By the it saw release in 2005 the style of death metal that Disgorge specialized in had ran it natural course. Once again fronted by a different vocalist it is the last of four records that the band released from 1992 to 2006. “Crown Of Souls”, the last release of the Jacoby Kingston era from fellow California act Deeds Of Flesh, was released the same year, and further evidenced this. In truth, the earliest sign of stagnation for the style was released a year prior with “Methods Of Execution”, the third and final record from the original run of Knoxville, Tennessee power trio Brodequin, who played a similar concussive style as Disgorge. 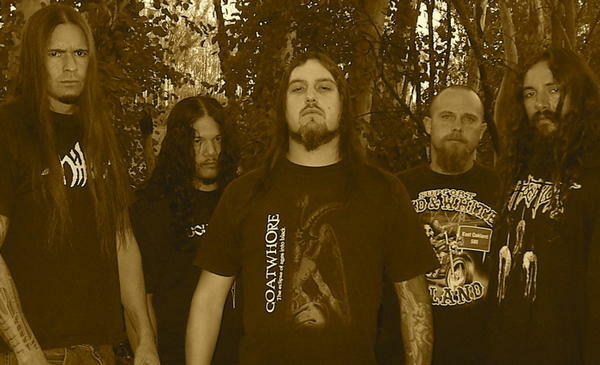 As was the case with the previous effort Disgorge wasn’t able to retain the services of its frontman. “Parallells Of Infinite Torture” positions Levi Fuselier in the vocal slot but he wasn’t able to hold on to the frontman position beyond this album and its touring cycle. It’s not noticeable that Disgorge changed frontmen on this album as Levi Fuselier sounds virtually identical to his predecessor AJ Magana. Fuselier goes more for a Frank Mullen (circa “Effigy Of the Forgotten) type direction, and his enunciation is leagues better than that of his unremarkable predecessor. As these things tend to go Disgorge never had any luck with their frontmen, and Fuselier – while functional and percussive – also overcompensates in visceral depth what he lacks in color and character. The anti-religious lyrical concept of “Consume the Forsaken” is continued. Many of the lyrics are similar in format and delivery to those of “Effigy Of the Forgotten” by NY death metal stalwarts Suffocation. If anything one of Disgorge’s most notable improvements post-Matti Way is that the lyrics only got better with each subsequent release. Even though “Parallells Of Infinite Torture” puts more of an emphasis on the gore/horror aspect the vivid religious imagery used in the lyrics are far better than what Deicide or Vital Remains were peddling at the time. Of all the Disgorge albums “Parallels Of Infinite Torture” has the best written and most intelligent lyrics. Considering that this is the same band that penned the lyrically abysmal “She Lay Gutted” earlier – it is heartening to see the band outgrow its tired gore roots for something altogether more interesting. The album is the recording debut for second guitarist Ed Talorda, and his presence allows for slightly more diverse guitar work. The lively interaction between Sanchez and Talorda is what makes these tracks work so well as they do. ‘Descending Upon Convulsive Devourment’, ‘Condemned to Sufferance’ and album opener ‘Revealed In Obscurity’ are probably the most diverse tracks Disgorge had ever penned at that point. That ‘Atonement’, a refurbished cut from the band’s 1996 “Cranial Impalement” demo tape, was included here should come as no surprise since the album by and large aims to reinstate the demo direction within a modern context. ‘Forgotten Scriptures’ is an atmospheric interlude. The title track is custodian to several bass guitar breaks. 'Descending Upon Convulsive Devourment’ has some quirky drum sounds in certain sections, but otherwise it is one of the better tracks on the record, especially when Disgorge tries to channel the churning darkness of Morbid Angel during the beginning of the track. It’s great to finally hear Marlin’s bass playing in the title track, even though it is ever so briefly. For the first time since its demo era the band is raising an effort to diversify its songwriting, and as such “Parallells Of Infinite Torture” is the most interesting of their efforts. Instead of maintaining sonoric stability between albums and returning to Studio One in Racine, Wisconsin the band opted to record locally. For this session the lesser known Blackbeard Studio in San Diego, California was chosen with Michael Kiner and John Beard in the production seat. For the first time Ricky Myers had a world class drum sound and Benjamin Marlin’s bass guitar could finally be heard properly. In keeping with the tradition of the preceding record the album was mastered at Imperial Mastering by Colin Davis of fellow California band Vile. Once again artwork by Texan tattoo artist Jon Zig was commissioned for the release. The album was released on controversial label imprint Crash Music, and subsequently spent some time in legal limbo when the label capsized (and later resurfaced). For all intents and purposes “Parallels Of Infinite Torture” is the most ambitious Disgorge effort. Not only because it breaks away ever so slightly from the very narrow direction of its two predecessors, but more importantly, because it actually genuinely tries to create an atmosphere. In ever such a small way Disgorge attempts to break away from its constant battering style of old, and although there’s still nary a riff that is repeated twice, here the Myers-Sanchez-Marlin axis at least tries to bring some flow and coherence into its rather bland and very regressive assault. For that reason alone “Parallels Of Infinite Torture” is more interesting than any of its two predecessors. It’s not exactly the second coming of its demo sound, but it at least hints at such miniscule progression. For the creatively stunted Disgorge that is a considerable step forward.